A driver has been charged after police allegedly discovered a gun in his car following a collision with an Audi in Glasgow. The white Audi crashed into the 29-year-old's white Nissan Juke on Gartloch Road, near Avenue End Road at about 06:30 on Saturday. It is alleged the two motorists were speeding before the crash which forced the Nissan off the road near Craigend. The Nissan driver faces charges on firearms and road traffic offences. Emergency services attended the incident and police allegedly discovered a weapon in the Nissan. 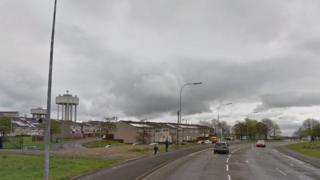 The driver was taken to the Glasgow Royal Infirmary to be treated for his injuries before he was arrested and charged. He was due to appear at Glasgow Sheriff Court on Monday and a report has been submitted to the procurator fiscal. Officers said the two cars were driving on Bargeddie Street in Riddrie prior to the crash and may have travelled to Gartloch Road together. Police are trying to establish if the firearm allegedly recovered from Nissan Juke was connected to the incident. Inquiries also suggest the Audi, which drove off after the crash, may be a Q7 model. Anyone with information on the incident has been urged to contact Police Scotland's non-emergency line. Insp Craig Warren said: "Our officers have been carrying out inquiries since the road traffic collision and we now believe that the vehicles were driving at speed from Bargeddie Street and into Gartloch Road before colliding in Avenue End Road. He added: "Think back, you may have heard or seen something that can help us. We would also ask for anyone with any dash-cam footage that could help us to come forward."